Robert Samuelson has been writing on economics and business for well over 30 years. However, he’s not an economist; his academic field at Harvard was government and politics. That alone may explain why his views on economics are more logical than those of professional economists. His principal point is that the retired elderly, contrary to conventional political propaganda, are not impoverished. They don’t live in hovels and eat dog food. While some may live in relative poverty, by official standards, the majority are doing better than younger people who are still working. People do not lose their obligations to the larger society by turning 65. We need to refocus these programs on their original purposes. Social Security was intended to prevent poverty, not finance recipients’ extra cable channels. Medicare provides peace of mind as well as health insurance; wealthier recipients can afford to pay more for their peace of mind. Burden-sharing needs to include the elderly. This is the crux of the budget problem. Facing it is both a moral and financial imperative. With the 2012 election looming, major overhauls of these programs seem unlikely. 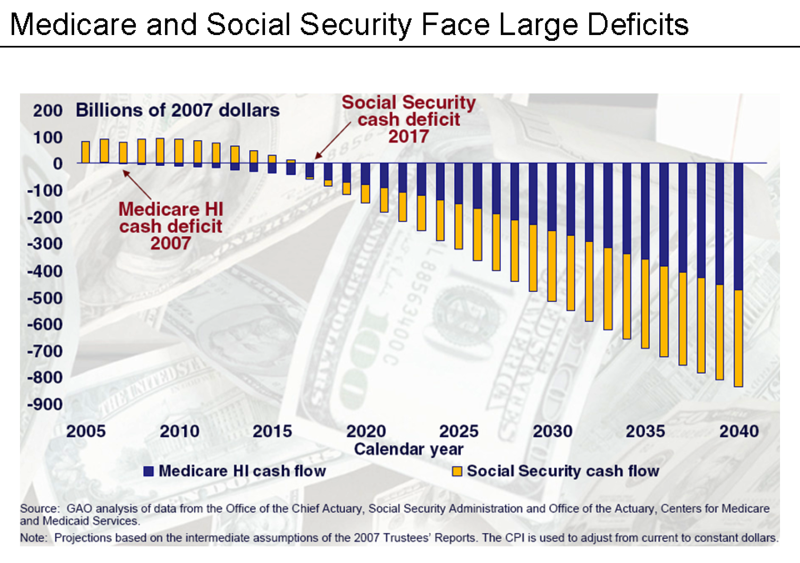 Still, more modest changes (slow increases in eligibility ages, added taxation of Social Security benefits, costlier Medicare for upscale beneficiaries) could produce significant savings. If even these are absent, the meaning will be plain: Old stereotypes continue to trump new realities. There are other areas of federal spending that also must be cut, including defense. And taxes must be increased not just for the wealthy but for everyone. However, no matter how you parse the numbers, there is no rational approach that does not include cuts in Medicare and Social Security. The present fiscal crisis is the greatest threat to America since the dark early days of World War II and the depths of the Vietnam War. We rallied and triumphed in the former, and we managed to muddle through the latter, barely. During World War II, the country rallied, people sacrificed for the cause, and even politicians generally behaved responsibly. During the Vietnam War, those positive factors were largely absent, but we managed to survive, although we still suffer the pains of national wounds inflicted by that godforsaken venture. If the sense of necessary shared sacrifice that rallied the Greatest Generation can’t be revived, the future will be bleak indeed. The shared sacrifice necessary now is for everyone to accept cuts in Medicare and Social Security benefits. Not just cuts that will apply to people who are in their twenties now and will take effect in 40 years, or some such scheme. That’s a political cop-out on the part of cowardly politicians. There needs to be means testing now for both Medicare and Social Security, and those who can must accept the reality that benefits must be reduced. That would mean increased Medicare premiums for those with higher incomes and reduced Social Security benefits, perhaps up to a maximum of 10 percent of Social Security retirement. Maybe these reductions could be eased once our fiscal house is in order, perhaps in 10 years or so. That’s far preferable to the looming collapse that we face now. And maybe after this necessary pain is inflicted on the country, citizens will begin to understand that they have to vote for politicians who place the welfare of the country first and are willing to make difficult decisions on taxing and spending. As one who benefits from Medicare and Social Security, I’ll say this without reservation: I’m willing to do my part. Are you? [N]o matter how you parse the numbers, there is no rational approach that does not include cuts in Medicare and Social Security. . . . If the sense of necessary shared sacrifice that rallied the Greatest Generation can’t be revived, the future will be bleak indeed. . . . The shared sacrifice necessary now is for everyone to accept cuts in Medicare and Social Security benefits. Social Security and Medicare are, obviously, big ticket items. It’s also obvious that some people don’t really need all or some of the benefits they receive. True, they had no alternative (other than ceasing to work) but to pay for them and true, the funds they “contributed” involuntarily went into the general fund and were used for all manner of federal spending – some of it maybe even a bit imprudent. True also, the Social Security “trust fund” has big stacks of federal I.O.U.s (accumulated for that reason) sufficient if cashed to continue payments as now required for a very long time; of course that would mean depleting the general fund or borrowing more money elsewhere, maybe from China; they like us. Maybe there should be means testing; but how does one devise the appropriately “fair” calculations – it can’t really be a “shared” sacrifice we are all willing “accept” unless it is “fair,” can it? Should there be geographical distinctions taking into account places where living costs are higher and lower? By region, state or municipality? Rural areas? Urban areas? Areas with substantial minority populations? Areas where “green” energy has taken hold? Red states vs. Blue states? States which have spent like drunken sailors and are now pretty broke vs. those which haven’t and aren’t? Are there to be other types of calculations? Perhaps for those deeply under water on mortgages now higher than the market values of their homes purchased during better times but who are still paying several thousand dollars monthly on them? Other financial obligations undertaken during better times? Should debts incurred through compulsive gambling count? Should we just trust a wise and prudent governmental bureaucracy to figure it all out for us? Wise and occasionally prudent CongressCritters? “Tax not me and tax not thee but tax the man behind the tree” is an axiom as old as it is common, and that’s what’s been happening for a very long time; special interests are bad — those benefiting the guy behind the tree but not those benefiting thee and me. Any means testing calculations are quite likely to be devised and made on that basis — just look at an IRS form 1040 or any of the hundreds of other IRS forms. Maybe “everyone” should “accept” cuts. But if everyone is to do that for a truly “shared” sacrifice, how about making it voluntary? How about a form, approved by the Office of Management and Budget (after all required Paperwork Reduction analyses) for each of us to use in sharing the sacrifices? Just fill in the appropriate form(s) and send a check each month in the amount of the Social Security/Medicare funds received unfairly. I’m quite willing to “sacrifice” my “fair” share; I just don’t know what it is. Dan, I understand everyone has a different concept of what’s fair. All the points you raise are valid, but if we don’t do something until all those unanswerable questions are answered, then we’ll all just stay chin-deep in the latrine pit with the muck still rising. Look, there’s got to be things done on taxes and spending in general. To deny that is to live in the Nile. But whatever the comprehensive package might look like, it must include Medicare and SS cuts. The only way to do that now and in a reasonable manner is to make progressive reductions based on means testing, with a cap on how high Medicare premiums will be increased and how much SS benefits will be reduced. Those with the lowest total income from all sources would would not have premium increases; those with the highest would have premiums increased by some amount. Same with SS retirement benefits — lowest income no cuts, highest maximum of say 10 percent. Those kinds of cuts across the total population involved would represent substantial savings, and no one would be severely penalized. These are obviously not the only things that can be done to reduce spending in those two areas, but they’re the biggees. The most serious problem we face is everybody wants someone else to sacrifice, but they don’t want to give up anything themselves. Corrupt (in a sense) and cowardly politicians in both parties obviously exacerbate the problem. Here’s a good example of another common problem: the tea partier screaming about reducing spending, followed by screaming, “Keep your government hands off my Medicare!” Ignorance obviously adds to the difficulty of getting anything done. Dan, what’s “fair” is whatever some thug politician says is fair. Tom, the line that is going to be drawn will be arbitrary. By dff, then, it cannot possibly be fair. It is an absurdity to assert that everyone needs to pay their “fair share” and still believe that all are entitled to equal treatment under the law. By dff, a progressive income tax does not treat everyone equally, as the lines drawn are arbitrary. “Fair” and “equitable” are antonyms of arbitrary.